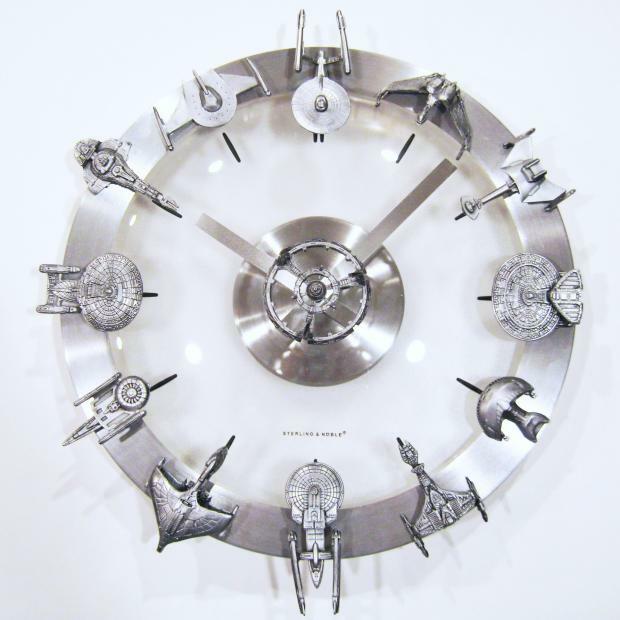 Way, way, way, way, way back in January of this year we took a look at a clock adorned with Star Wars vehicles that was being sold on Etsy.com. If you saw the clock and hoped against hope for a Star Trek version, your (space) ship has finally come in. The Star Trek version costs $109.99, a bit more than the Star Wars version did at $90, but maybe there’s some sort of premium on Star Trek paraphenalia. There are “12 vintage classic Action Fleet Micro Machine starships, warships, and other vessels” that have been “hand finished in a black and silver pewter-like color.” As with the Star Wars version, you can ask for custom ships or vehicles, which the creator will include if he has them in stock.